There are two styles of practical footwear – slippers and boots. The prices stated here are applicable to fabrics that are currently in stock. Please get in touch about custom fabric requests including wrap scraps. 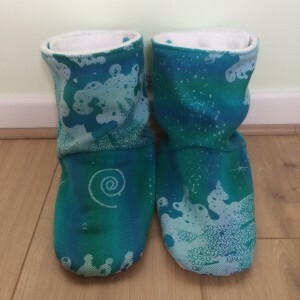 The slippers have an elasticated ankle and are lined with velour, plush or fleece, making them soft and snuggly inside. I can also line them with cotton for warmer climates. The boots are unique, made from a pattern developed from scratch at Purple Lane. These boots were designed to keep little feet warm in the sling. 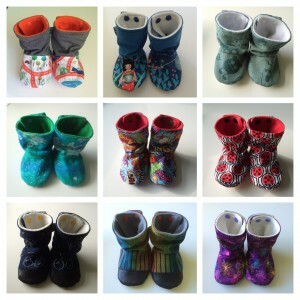 They have a piece of strong elastic hidden in the ankle, which means they stay on when kicked – feedback from many customers is that these are the only boots they can get to stay on their little one’s feet. The calf is adjustable to two widths, to fit slimmer and chubbier calves, or to fit a thicker piece of clothing tucked in to the boots. They are usually lined with polar fleece, making them warm and soft, but I can also line them with cotton for warmer climates. 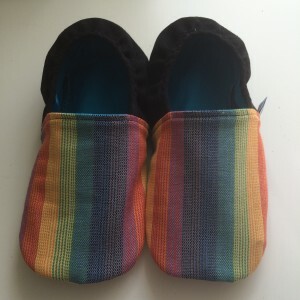 For both slippers and boots, sizes 0-3m and 3-6m have a soft sole, and sizes 6-12m and beyond have a grippy sole, perfect for crawlers, cruisers and walkers. As for sizing in the 0-12m range, these are age guides based on average sized babies. If you are unsure on which size to choose, I recommend at least 1cm on the end of the foot length for a good fit with room to grow. Measure with socks on, from the back of the heel to the end of the big toe along the sole of the foot. If you need any more advice on this, please get in touch. And slippers and boots are available for adults too! 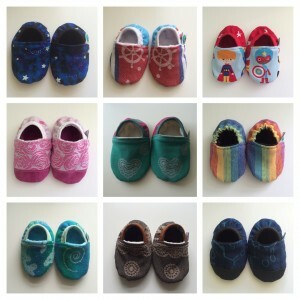 Since making soft shoes and boots for babies and toddlers, I’ve been asked to make them for adults too. They are available to order in UK adult shoe sizes, and all have a grippy sole.